Panthertown Valley is designated by the North Carolina Wildlife Resource Commission as part of the Panthertown-Bonas Defeat bear sanctuary. Bears live here and are protected here. This is their natural habitat. Due to recent significant bear activity in Panthertown, the U.S. Forest Service has issued a forest alert concerning bear encounters in Panthertown Valley. Over this past weekend one or more black bears visited campsites in Panthertown Valley near Mac’s Gap, Green Valley, and Little Green Mountain (including Greenland Creek, Panthertown Valley Creek, and School House Falls). Campers reported to the U.S. Forest Service that the bear(s) came looking for food, tore apart properly hung bear bags, caused damage to tents and packs, and returned to the campsites even after being chased off. Don’t let this happen to you. Black bears are looking for food. If you leave trash or food unattended at your campsite bears will smell it, find it, and attempt to steal it. Here is a National Park Service photo of the after effects of leaving your food unattended. 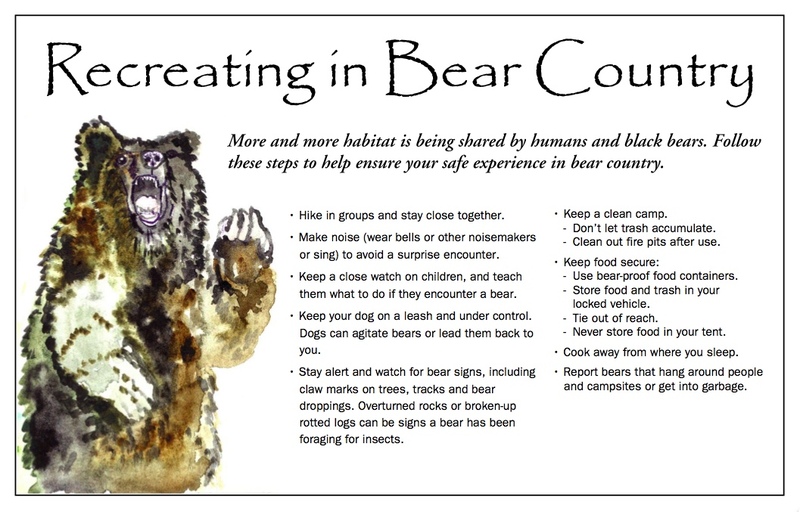 The USFS also recommends campers take special precautions due to the recent bear activity by securely placing food and garbage in scent proof metal bear cans or boxes. 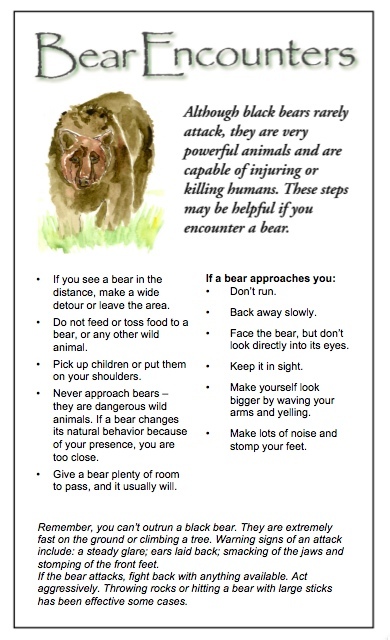 Here are some bear awareness posters the U.S. Forest Service has shared with us. Click image to enlarge. 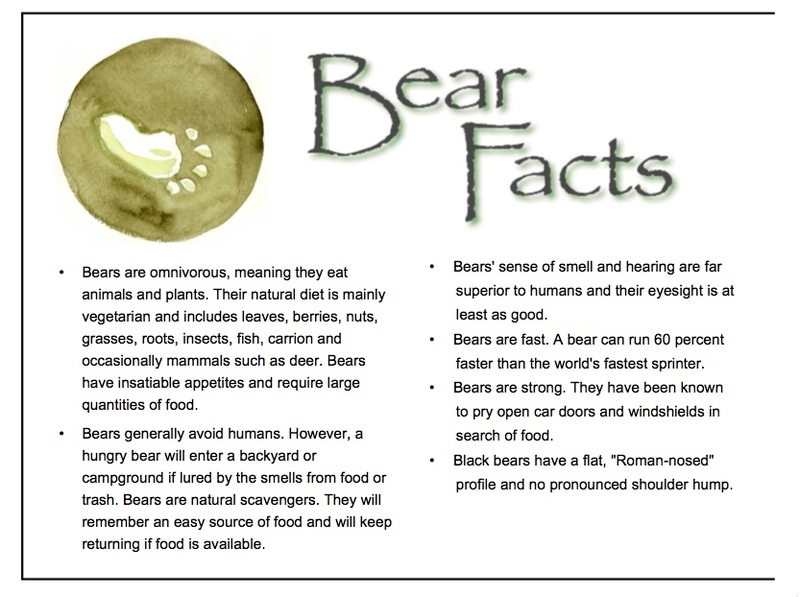 JACKSON COUNTY, N.C. — The U.S. Forest Service is discouraging people from backcountry camping and from bringing food into the Panthertown Valley area of the Nantahala Ranger District, Nantahala National Forest, following several bear encounters. The area is northeast of Cashiers, N.C. If the visitors choose to camp in the Panthertown area, they should camp in areas that are used infrequently. Three separate incidences of bear encounters occurred recently that involved damaged tents and stolen food. Some of the food was properly hung in trees. No injuries were reported. The incidents occurred in the vicinity of the Mac’s Gap, Green Valley and the Little Green Mountain area. 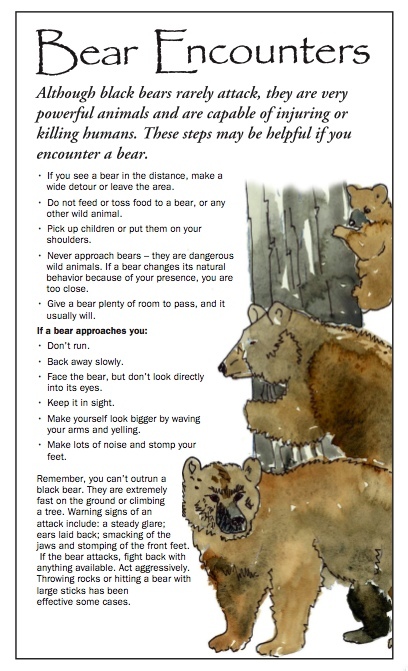 Know Before You Go – Black Bears (105 KB PDF) for a complete list of safety tips provided by USFS. WNC bears adaptable, growing in number Asheville Citizen-Times October 13, 2012.